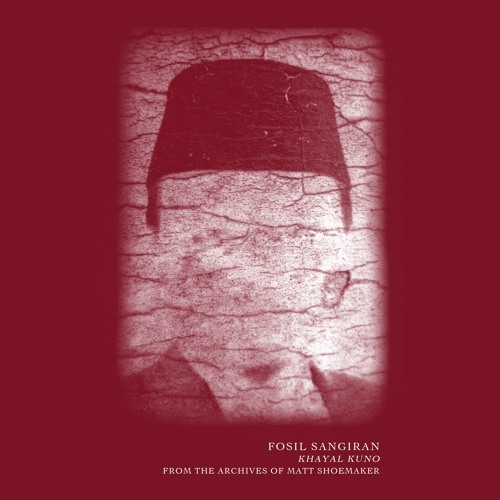 Fosil Sangiran is the pseudonym for Seattle polymath Matt Shoemaker (1974-2017). The two recordings that have been uncovered from his archives under this moniker were recorded during a lengthy sabbatical in Java, Indonesia between 2012 and 2013. Though these works both operate very clearly within Shoemaker's aesthetic, he choose to operate under this moniker to provide a clarifying distance from what he believed to be his commonplace birth name. Sangiran refers to the UNESCO world heritage site in Indonesia where numerous archeological discoveries have been made providing insight into the understanding of early human development. It's an apt metaphor to his churning arrays of psychotropic sound design, which give the allusion of being distressed from aeons of jungle rot. Khayal Kuno represents one of several detours that Shoemaker undertook over his career. Instead of the long-now drone mutations, Shoemaker turns his attention to an interplay between warbling cassettes and primitive rhythm-box sequencing. The minimal, proto-techno explorations suitably evolve slowly out an initial dispersion bloom from swarms of cassette splutter and insect mimesis. Cast within his slinkies-as-spring-reverb contraptions that provided a signature Kirlian glow to his work, Shoemaker's foray into the realm of the rhythmic are masterful declarations of his under-recognized talents. Through his brilliant aptitude for cross-hatched filtering, spatialized modulation, and electro-magnetic tricknologies, his stark pulsations take on organic qualities through a surging fluidity and a varispeed vortex of blank hypnosis. His motorik pulsations recall a rich if elusive vein of taut, industrially minded electronica sculpted by Monoton, Nord, Omit, and Conrad Schnitzler at his most laser focused.